Delta has a variety of Boeing 767s in its fleet, but they generally have seven seats in each row in Economy — two pairs on each side, and a trio in the middle. @TheReelLi was sitting in an “aisle seat in the middle section in coach,” and, based on her picture, it was an E seat (with the aisle to her right). As you can see in this photo, the top of the Petascope is solid. I prefer a mesh panel on top, so I can see down into my pet’s carrier — and ideally a panel with a hatch in it, so I can also reach in easily with pats, treats and ice cubes. There are large mesh panels on each long side of the carrier, however, and the door is mesh too, so I have no concerns about ventilation (please note that Teafco also makes the Argo Aero-Pet carrier, which has significantly smaller mesh panels — it’s for tiny pets, but still, I can’t love it). I should note, too, that the Petascope does not include straps through which you can pass a car’s seatbelt. Your best option for securing the carrier in a car is the handle — sneak the head of the seatbelt through it, and do what you can to spread the belt across/around the carrier. That said, the Petascope is a well-built carrier, and a stylish one too. It comes in a range of cheerful colors, but given its size, I urge you to buy it the slimming charcoal/black @TheReelLi selected. 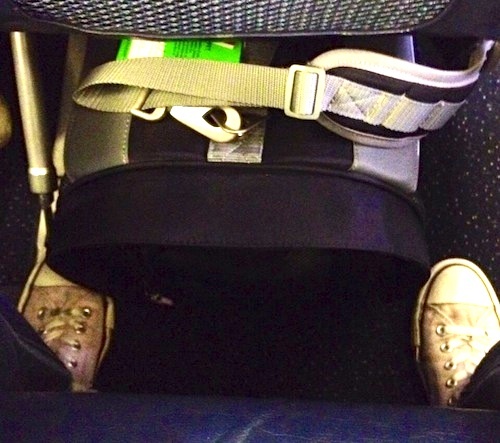 Thanks so much to @TheReelLi for sharing her photo and the encouraging news that a carrier this size works on a Delta 767 (and in Economy class, too!). I hope this is just the first of many great trips you and Hondo take together. I’m adding this to Dog Jaunt’s ongoing series of posts recording airplane under-seat measurements, and I’m tagging it so it appears in Dog Jaunt’s ever-growing collection of pictures of carriers deployed under plane seats.